The heartbreaking consequences of Hurricane Harvey’s landfall in Texas and Louisiana over the past week have led many public figures to comment regarding the potential connection between hurricanes and global climate change. With Hurricane Irma bearing down on the Caribbean and Florida, this question will likely get another bump in the news cycle. That remains a good summary as far as hurricanes go, but there is a more fundamental point that I think decision-makers should be focused on as they consider how to direct investments to enhance our resilience to climate change: Precipitation extremes are intensifying and will continue to do so as the climate warms. In April 2014, southern Alabama and the Florida Panhandle experienced a historic rainstorm that set local records for daily and hourly rainfall totals. In Pensacola, nearly 6 inches of rain fell in an hour and more than two feet of rain fell over two days, causing catastrophic flash flooding. In October 2015, many areas of Alabama, Louisiana, and Texas experienced extreme rainfall and flash flooding. The greatest totals were south of Dallas, where more than 20 inches of rain flooded highways and derailed a freight train. Houston received around 10 inches and experienced flash flooding. In March 2016, Louisiana experienced historic flooding and areas of Arkansas, Missouri, Oklahoma, Tennessee, and Texas experienced extreme rainfall and flash flooding. More than 20 inches of rain fell in Monroe, Louisiana, with one reporting station recording nearly 27 inches over three days. Now we have Hurricane Harvey. These events are a small selection of a large number of major flood events to strike Arkansas, Louisiana, Oklahoma, and Texas recently. Gulf states have seen historic flooding disasters from extreme precipitation every year for at least four years running. Many of these events were associated with hurricanes (or tropical storms in general). All of them required an enormous source of atmospheric moisture to generate such extreme rainfall totals in a matter of hours to days. That moisture source is no mystery: It is the warm tropical waters of the North Atlantic (principally the Gulf of Mexico) and eastern Pacific oceans. These bodies of water have been warming over recent decades and are evaporating more and more moisture into the atmosphere along the Gulf and Atlantic Coasts. The atmosphere is also warming, and warmer air holds more water vapor. As the climate warms, therefore, more moisture becomes available to supply rainfall. This fact is basic physics and there isn’t any real uncertainty about it. Moreover, it is well understood that the oceans and atmosphere are warming as a direct result of manmade greenhouse gas emissions. (Without those emissions, the climate system would actually be cooling slightly). The consequences are not limited to the Gulf Coast. 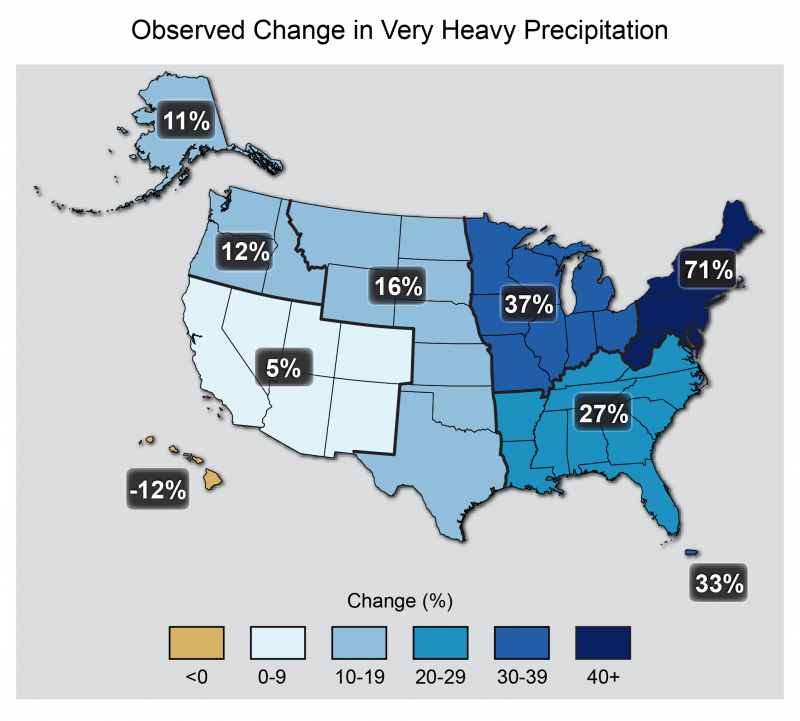 The National Climate Assessment chart below shows the percent increase in the amount of rainfall associated with the heaviest 1 percent of downpours in regions of the United States from 1958 to 2012. So what does Hurricane Harvey tell us about climate change? It confirms that our risk is rising as the climate warms. Harvey also teaches us about our vulnerabilities and adaptation needs. As Dan Huber and I have explained, individual weather events are unpredictable, but our overall risk from changing weather patterns is predictable. Reducing our climate-warming greenhouse gas emissions will limit how much we ultimately ratchet up that risk. However, since the climate is already changing and the risk of damages is rising, we also need to adapt to the changes that are in the pipeline. Both reducing emissions and adapting to unavoidable change are essential to managing the risk.